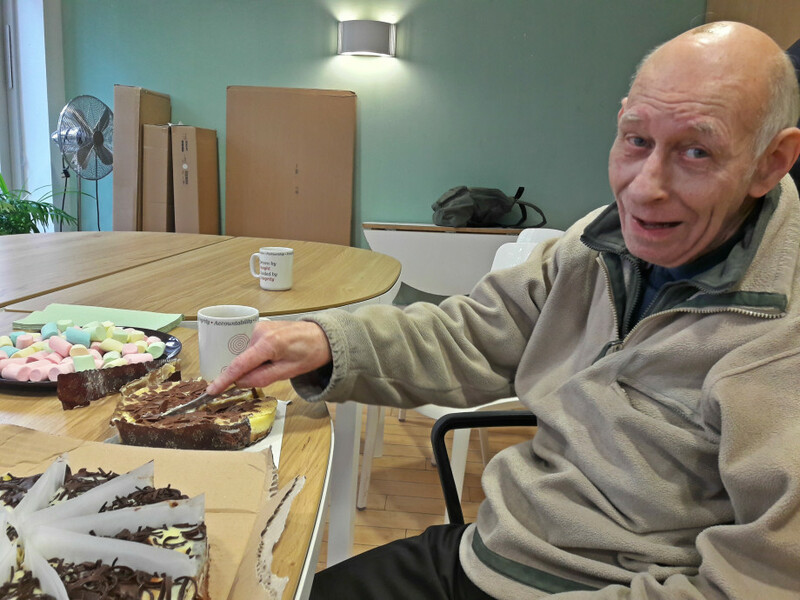 Service User Charlie celebrates his 75th Birthday! On Tuesday, this week, we celebrated the 75th birthday of one of our Outreach’s oldest Service User Charlie Merriman. Charlie has been part of our Outreach Service since the service started in April 2011. Charlie was born in 1940s and shares the same date of birth as his favourite singer Vera Lynn! Charlie is a keen musician and plays jazz music and continues to play in various bands across London. He is a gentle and kind person who is always happy to help others. He is also a very fit person; his doctor told him on a recent visit that his heart is similar age to someone in their 30s! Here at Centre 404 Outreach Service, we are very proud to have the honour of supporting him and look forward to continuing supporting him for many years to come. To celebrate his birthday, we dedicated our monthly team meeting to this occasion and invited Charlie to share a cake and few other sweets with rest of the Outreach Team. As Charlie gets 7 days a week support, nearly everyone from the Outreach has at some point worked with Charlie. Staff members present shared their fun stories of working with Charlie and Charlie also shared his vast life experience with us. The party was kept as a surprise to him so Charlie appeared very happy and thanked the team for their support. We wish Charlie all the best and were thrilled to have shared this special day with him.